Can someone ID this Flower? These flowers are growing wild all over my lower 40. They have just started to bloom in the last month here in Southern Oregon. Also, are they harmful to animals? Hello and welcome to the forum. 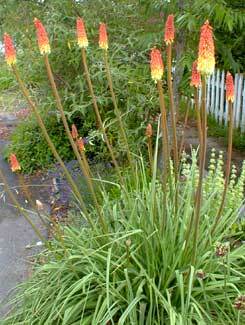 My sister was always fond of a plant called 'Red Hot Poker' I did not know the botanical name so I Googled that common name and found this. red hot poker....... um dunno bout animals. Not sure about poisonous. I do know rabbits and deer do not like to eat them but I think that is flavour and texture rather than poisonous. I guess that means not. Thanks for the quick answers folks. Not many flowers (any?) in my area that the deer don't eat. Nice to have some color in the area without having to erect a 10' fence. I'm gonna leave them there and try to keep the goats away from them. I'll know pretty quick if they like them.